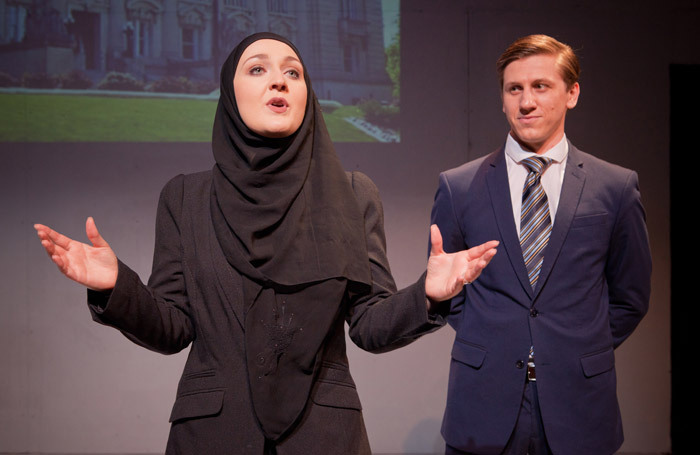 Based on true accounts of young women running away to join IS, Chicago-based playwright Selina Fillinger’s debut play Faceless (which she wrote as an undergraduate) is puzzling. There is undoubtedly a gripping piece of theatre to be made about this subject but the over-reliance on courtroom rhetoric along with Prav MJ’s somewhat stop-start direction adds up to a piece that is more distancing than involving. Revolving around the trial of ‘Wonderbread white’ 18-year-old Susie Glenn (Fiona Gent) and her attempt to become an IS bride (converting to Islam on Twitter using #ISIS), young lawyer Claire (a compelling performance by Paige Round), a Harvard graduate, is selected by the prosecution as the embodiment of the rational voice of an American Muslim woman. Susie herself remains an elusive figure. Whilst her defence lawyer puts forward the perfect sob story of a lonely child traumatised by the recent violent death of her police officer mother, it would have been illuminating to have learned more about her growing fanaticism and her awareness of special treatment as a white woman in her own words. Matt Mella’s obnoxiously preppy hotshot prosecutor Scott Bader is clearly supposed to be the embodiment of white male entitlement (naturally, he plans to go into politics), but he also jarringly serves as comic relief. The stock images of offices and a prison meeting room projected on the wall are appropriately harsh, if crudely generated. The characters remain detached from each other throughout and a stronger emphasis on the connection between the two women might have made for more emotional involvement.